Pro-boycott activists accuse Haifa of mistreating politics lecturer Ilan Pappe for defending a graduate student's research into controversial areas of Israeli history. The university denied this and threatened legal action against the AUT. Bar-Ilan is alleged to have helped with degree programmes at a college in a settlement in the West Bank. But it insists this is autonomous. 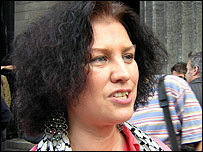 Sue Blackwell, an English lecturer at Birmingham University and a leading pro-boycott activist, had predicted a "stitch-up" by opponents. Supporters of both sides gathered outside the Friends Meeting House in central London venue after the vote, which had been closed to the media. Boycott opponents claimed three-quarters of members had voted to end the sanctions. Luciana Berger, a member of the Union of Jewish Students, from Birkbeck, University of London, said: "We are very happy. It's a victory for peace and open dialogue. "It's a victory that we shouldn't have had to have won in the first place." However, Professor Steven Rose of the Open University, a boycott supporter, said the debate would lead to the state of Israeli higher education being discussed "on campuses up and down" the UK. 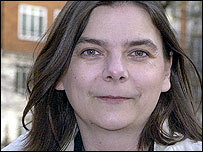 Sally Hunt, AUT general secretary, said: "It is now time to build bridges between those with opposing views here in the UK and to commit to supporting trade unionists in Israel and Palestine working for peace."